Aujourd’hui, je souhaite vous familiariser avec la réalité de la nouvelle loi californienne eu égard à la mise en place de quotas pour accélérer la diversité sur les conseils d’administration. Cet article paru sur le site de Harvard Law School Forum on Corporate Governance, par David A. Katz et Laura A. McIntosh, associés à la firme Wachtell, Lipton, Rosen & Katz, explique le contexte menant à la nouvelle législation californienne. La Californie se distingue par l’originalité et par le caractère affirmatif de sa loi sur la composition des conseils d’administration. Bien entendu, cette loi a ses détracteurs, notamment les chambres de commerce qui redoutent les impacts négatifs de la loi pour les plus petites entreprises qui ont des CA composés essentiellement d’hommes ! Mais, il faut noter que l’état de la Californie est le seul état américain à avoir légiféré sur la diversité des membres de conseils d’administration en proposant des mesures qui s’apparentent aux quotas imposés par plusieurs pays européens. Voici un extrait de l’article qui résume assez bien le contenu de cette loi. The bill that passed the California State Senate at the end of May 2018 would, if enacted, require any public company with shares listed on a major U.S. stock exchange that has its principal executive offices in California to have at least one woman on its board by December 31, 2019. By year-end 2021, such companies with five directors would be required to have two women on the board, and companies with six or more directors would be required to have three women on the board. California has made headlines this summer with legislative action toward instituting gender quotas for boards of directors of public companies headquartered in the state. The legislation has passed the state senate; to be enacted, it must be passed by the California state assembly and signed by the governor. In 2013, California became the first state to pass a precatory resolution promoting gender diversity on public company boards, and five other states have since followed suit. The current legislative effort has come under criticism for a variety of reasons, and, while it is not certain to become law, it could be a harbinger of a broader push for public company board gender quotas in the United States. It is worth considering whether quotas in this area would be beneficial or harmful to the larger goals of gender parity and board diversity. Section 1 of the California bill (SB 826) presents an argument in favor of establishing gender quotas: More women directors would be beneficial to California’s economy in various ways, yet progress toward gender parity is too slow. The bill cites studies indicating that companies perform better with women on their boards and observes that other countries have used quotas to achieve 30 percent to 40 percent representation. 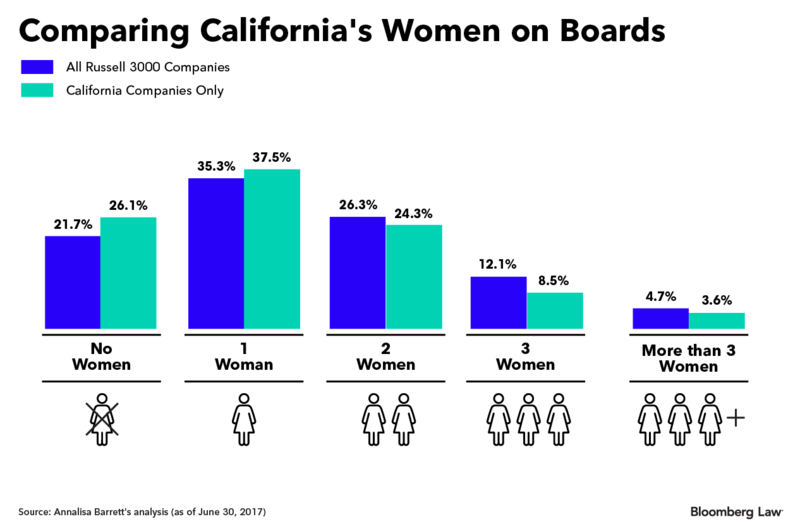 The bill notes that, of California public companies in the Russell 3000 as of June 2017, 26 percent had no women on their boards, while women composed 15.5 percent of directors on boards that have at least one woman. The bill cites further studies showing that, at current rates, it could take approximately four decades to achieve gender parity on boards. And finally, Section 1 of the bill concludes by citing studies suggesting that having at least three women directors increases board effectiveness. The California bill has been controversial. The California Chamber of Commerce filed an opposition letter on behalf of numerous organizations arguing that the bill would violate state and federal constitutions and conflict with existing California civil rights law, on the basis that it requires a person to be promoted—and another person disqualified—simply on the basis of gender. California legislators dispute that the bill requires men to be displaced by women, noting that boards can simply increase their size. This may be easier said than done, however: Because the required quota increases with board size, a company with a four-man board that did not wish to force out a current director would need to add three women to accommodate the requirements of the law by 2021. Suddenly expanding from four to seven would entail a very significant change to board dynamics. For a previously well-functioning board, the negative effects of a change that dramatic could outweigh the benefits of gender diversity. Further, the bill’s opponents argue that prioritizing only one element of diversity would be suboptimal, especially at time when many California companies are engaged in addressing and increasing diversity by focusing on all classifications of diversity. Advocates for greater representation of ethnic minority groups on boards have expressed concerns that prioritizing gender will be detrimental to progress toward greater ethnic diversity. For purposes of increasing overall diversity, quotas are not a solution that can be applied broadly; if quotas such as those in the California bill were established not only for gender but for ethnic and other categories of diversity, the project of board composition would soon become a near-impossible logic and recruitment puzzle, as nominating committees struggled to meet mandated quotas, expertise needs, and director independence requirements, all within the board size parameters set forth in the company’s organizing documents. Board functioning and effectiveness would be severely compromised by the legislative micromanaging of board composition. Thanks to the establishment of quotas in various European countries over the past 15 years, there is evidence as to the effect of gender quotas for boards. A 2018 Economist study found that, despite high expectations, the effects of quotas were, in some ways, disappointing. According to the Economist, greater numbers of women on boards did not necessarily produce better performance or decision-making, nor was there a trickle-down effect of boosting women’s progress to senior management jobs. On the other hand, fears about unqualified women being put on boards, or a few qualified women being overboarded, also did not materialize. While there is a great deal of evidence showing that having women directors does produce more effective boards—and there are even indications in Europe that diverse boards are less likely to be targeted by shareholder activists—the Economist study shows that diversity achieved through government-imposed quotas may not be as beneficial as diversity achieved through private-ordering efforts. Progress toward gender diversity in the board room is accelerating. In the first fiscal quarter of 2018, nearly one-third of new directorships in the Russell 3000 went to women, and for the first time, fewer than 20 percent of companies in that index had all-male boards. Institutional investors, corporate governance activists, and many large companies have been at the forefront of this progress. State Street and BlackRock have been leaders on this issue in the United States. Similarly, in the UK—a country that has made significant efforts to improve gender diversity on boards while also resisting the imposition of quotas—the large investment funds Legal & General Investment Management and Standard Life Aberdeen Plc have said that they will vote against boards that are composed of less than 25 percent or 20 percent women, respectively. British institutional investor Hermes has said that it expects boards to include at minimum 30 percent women, and it led a failed opposition to the reelection of the chairman of mining group Rio Tinto Plc due to lack of diversity on the board. Given the effectiveness of recent efforts by the private sector, and in light of the intense resistance to quotas in the business community, government intervention to establish quotas may be unnecessary as well as undesirable. Recent research shows that simply adding women to boards does not necessarily improve board performance. As common sense would suggest, it turns out that to be a positive factor, the gender composition of the board must be considered along with the skills and knowledge of the board as a whole in the context of the organization and its stakeholders. A 2017 academic study indicated that the “right” level of gender diversity may be proportionate to the number of female stakeholders—employees, clients, and suppliers, for example—and may vary across countries and cultures. In certain circumstances, the appropriate gender diversity ratio might well be over 50 percent women. The authors of the study caution against selecting directors based on quotas if, in so doing, gender diversity is prioritized over the expertise needs of the board. Overall board diversity, including gender and ethnic minorities, has never been higher. According to a comprehensive 2018 study by James Drury Partners, overall board diversity is now at 34 percent for America’s 651 largest corporations, as measured by revenue and market capitalization. The level of board diversity is increasing, as 49 percent of the 449 newly elected directors at these companies represent diverse groups. Of particular note, the study revealed that the diversity distribution of the 6,225 directors currently serving on the boards of these companies corresponds very closely to the diversity of the population in the executive ranks of 222 companies studied by McKinsey & Co. and LeanIn.org. While there clearly is more room for progress toward greater diversity at both the executive and board levels, this data point shows that boardrooms are indeed mirroring the increasingly diverse leadership of U.S. business. The benefit of mandatory quotas, as the business community has seen through European examples, is that they compel companies and shareholders to focus on board composition and to establish more formal recruitment processes in order to find the necessary directors. Such developments are certainly beneficial. That said, boards can and should focus on composition and recruitment in the absence of quotas, and indeed they are doing so to a greater extent than ever before. Proponents of gender diversity can be heartened by recent developments in the United States, as organic and market-driven efforts have produced results that increase the business community’s enthusiasm for diverse boards. A real danger of legislation like the California bill is that context-free quotas may have the effect of destabilizing boards and undermining the business case for increased gender diversity. Were that to occur, then not only boards themselves, but stakeholders, the business community, and the larger societal goals of gender parity and board diversity would suffer as well. *David A. Katz is partner and Laura A. McIntosh is consulting attorney at Wachtell, Lipton, Rosen & Katz. This post is based on a Wachtell Lipton memorandum by Mr. Katz and Ms. McIntosh that originally appeared in the New York Law Journal.